Pixar’s new movie, UP, raked in a healthy $68 million in ticket sales over the weekend, and seems poised to be another hit for the Oscar-winning animation studio. It’s the tale of an elderly curmudgeon named Carl Frederikson (voiced by Ed Asner) who decides to get away from it all via a unique mechanism: he strings an enormous bunch of helium-filled balloons to his house, lifting it high into the air. And thus begins an adventure that takes Carl — and a trusty young boy scout companion who befriends the old man — to the exotic jungle world of Paradise Falls. That’s a fictional locale, naturally, but directors Pete Doctor and Bob Peterson, with guide Adrian Warren, did visit numerous locations in South America to get just the right look for his animated rain forest. Where’s the science? You might well ask. Well, science is everywhere, in this case, in the balloons Carl uses to turn his ramshackle little house into a lighter-than-air craft. 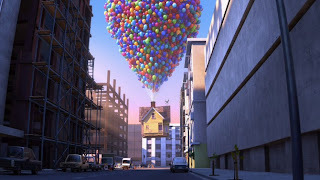 Wired Science took it one step further and did the math: just how many helium-filled balloons would it take to lift Carl’s house that high in the air? First, they got an estimate of how much said house would weigh: 100,000 pounds. Then we did some calculations. Air weighs about 0.078 pounds per cubic foot; helium weighs just 0.011 pounds per cubic foot. A helium balloon experiences a buoyant upward force that is equal to the air it displaces minus its own weight, or 0.067 pounds per cubic foot of helium balloon. One more simple calculation — 100,000 pounds divided by 0.067 pounds per cubic foot — and you’ve got that it would take 1,492,537 cubic feet of helium to lift the house. Of course, you’d need some more balloons to keep getting it higher, but that’s our minimum. Now, let’s assume you’ve got a bunch of spherical balloons three feet in diameter. They’ve got a volume in 14.1 cubic feet, so you’d need 105,854 of them filled with helium to lift the house. Eyeballing the cluster of balloons above the house in Up, let’s say on average, it’s 40 balloons across and deep and 70 balloons tall. Do the math and there could be 112,000 balloons in there. Carl has a couple of real-life counterparts: in 1982, Larry Walters attached a bunch of helium-filled balloons to a lawn chair and took flight. He in turn inspired a Bend, Oregon, man named Kent Couch to do the same in 2007. Couch actually traveled a good 200 miles in 9 hours, using 100+ helium balloons, just shy of his goal of making it to Idaho. That’s still far short of the distance Carl travels in UP, but Couch is probably happy to cede the crown: turns out those helium-filled balloons are darned expensive. One can only imagine how much Carl’s estimated 112,000 balloons would cost. But that’s a calculation for another post.